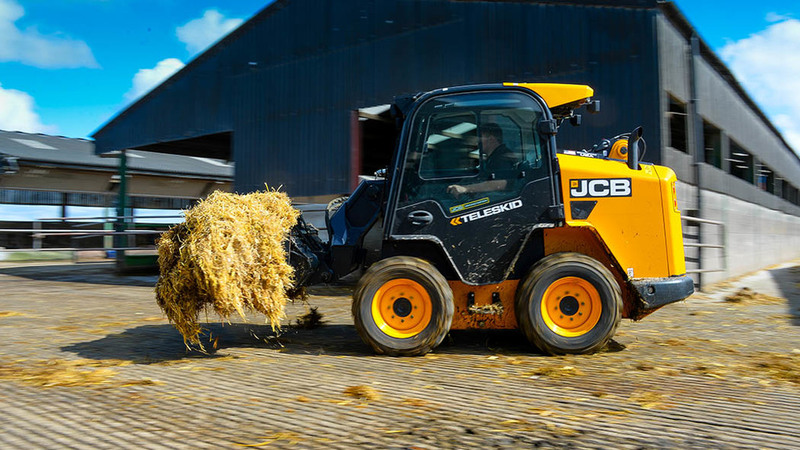 Aiming to increase flexibility with increased reach and lift height, JCB has launched a telescopic version of its skid steer loader. Richard Bradley put the firm’s Teleskid through its paces. The Teleskid is a new take on a skidsteer loader. Although ideally suited to working in confined spaces, thanks to their on-the-spot turning ability, skid steers are often flawed in a number of other crucial areas, primarily with safe access into the machine, lift height and forward reach. Having combated access with a single side-boom design, it does not take a genius to figure out how JCB aims to overcome the other issues with its novel Teleskid. Teleskid happily handles large square bales, however, a little caution with controls is required. Based on its existing large frame 300-Series skid steers, the Teleskid is only available in one model and specification, with limited optional extras. 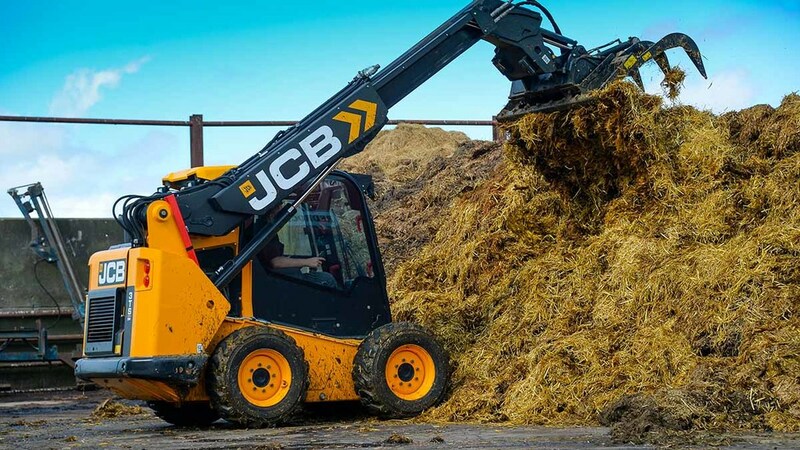 JCB says the telescopic boom on its skid steer machine gives extra flexibility, making it better suited to work as a sole machine on smaller farms or to reduce the workload of a primary loader on larger farms. To find out if this is the case, we put the Teleskid to work in its natural environment, supporting a larger loader on a modern dairy farm. Capable of a maximum lift height of 4.05 metres (13.3ft) to its pivot pins, the Teleskid’s boom can extend by up to 2.25m (7.4ft). At maximum forward reach, the skid steer is rated to 611kg lift capacity, and with the boom retracted, can shift a 1,000-litre IBC around the yard with ease. Thanks to a revised design, views to the headstock are good. When tipping onto the muck heap with a decent sized grab full of muck at maximum height and reach, the machine had no issues from a heavy handed operator. Similarly, it was equally happy moving and stacking large square bales up to four high. To adjust the loader’s responsiveness, one of three control setups can be selected, all of which can be reprogrammed to suit users and different attachments, which may not require the same levels of aggression. Up front, the tilt cylinder has now been relocated inside the mast itself to improve attachment views when boomed out. While not an issue when working with the grab, maximum dump angle with the firm’s own bucket is only 42 degrees, which could be an issue if loading into a trailer. Additional lift height allows the plucky skid steer to load into trailers and build a decent sized muck heap. Providing drive to implements, 90-litre/min auxiliary couplers are mounted to the telescopic boom, while high flow 125-litre/min lines and a simple depressurising lever remain on the fixed element of the boom. High flow couplers can only be used when the boom is retracted. JCB says this is to prevent users extending the boom when using large attachments, such as mulchers, which could potentially cause some stability issues. During mucking out duties, the ability to extend the boom allowed clearer views when working up to walls and also allowed you to pull material away from obstacles without having the issues of getting stuck on the loose bedding. To cope with extra strain from the boom’s telescopic capabilities, the main pivot point at the rear and its turret have been beefed up, and a rugged looking cast counterweight is mounted at the rear to provide additional ballast. Power is supplied by a 4.4-litre JCB Ecomax engine, which puts out a punchy 74hp, and up to 400Nm torque. Drive is provided by a two-speed Bosch Rexroth hydrostatic transmission, with one wheel motor used to drive left-hand wheels, and one for right-hand wheels. Wide opening bonnet allows easy access to daily servicing points. Top speed in either range is 10.9kph (6.8mph) and 20kph (12.4mph), allowing for accurate control, or seemingly quick movements around the yard. 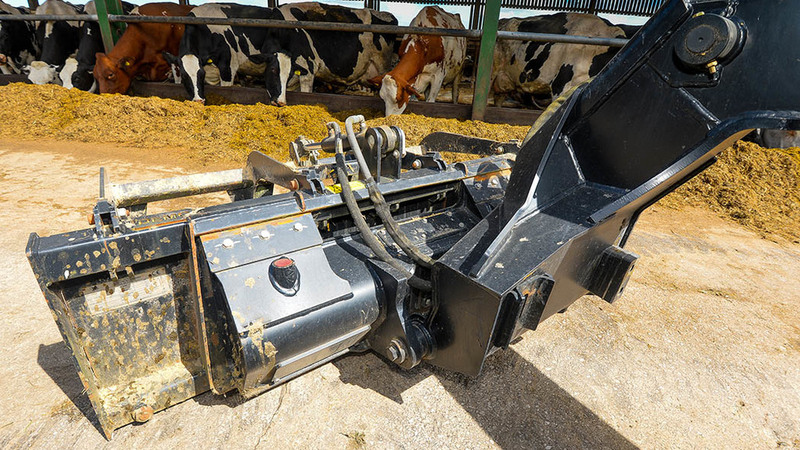 Another creeper speed is also featured, where forward speed can be adjusted via a rocker switch to suit tasks with hydraulically driven implements, such as bedding dispensers. Similar to loader setup, three transmission modes are featured, which can be reprogrammed to suit each user. While trialled in each mode, we found even softer setups may be ideal for general yard work, as sharp responses tend to make for slightly jumpy movements. Servicing access is good, with most filters and service points accessed via the wide-opening rear bonnet, and transmission access via removing two bolts and pivoting the cab forward on gas struts, even with the boom on the ground. 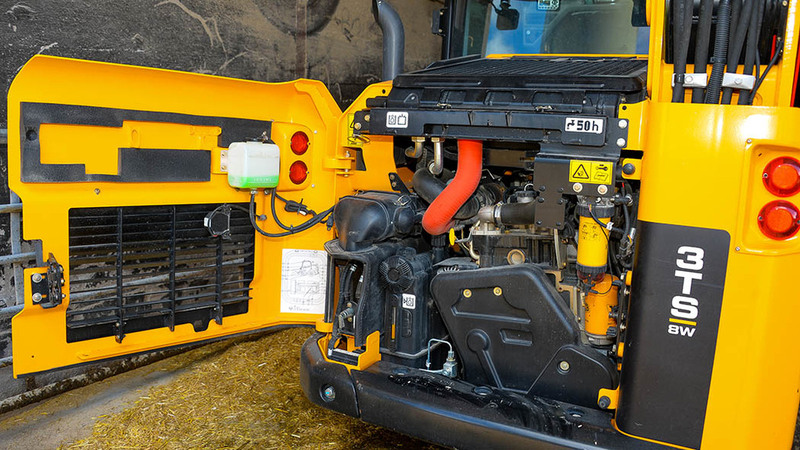 Another handy feature is the radiator’s auto-hydraulic reversing fan. Thanks to its side-boom design, getting into the cab via its wide-opening side door is as easy as with any conventional telescopic loader. 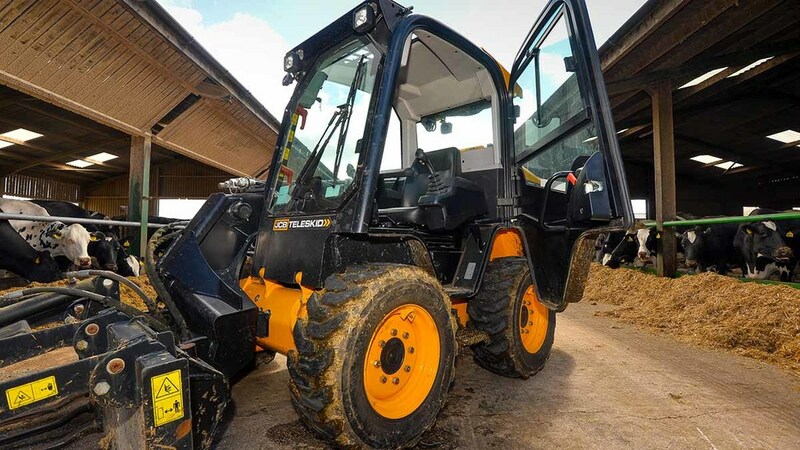 While traditional skid steer H-pattern controls on two levers can be used, in ISO mode, the JCB uses one joystick to control loader movements and another to control directional travel. After a few hours driving, this becomes pretty much second nature, and a wide angle mirror in the cab provides good views over the rear of the machine when turning and reversing. To suit users in JCB’s leading skid steer market, the USA, a supersized cup holder is provided. 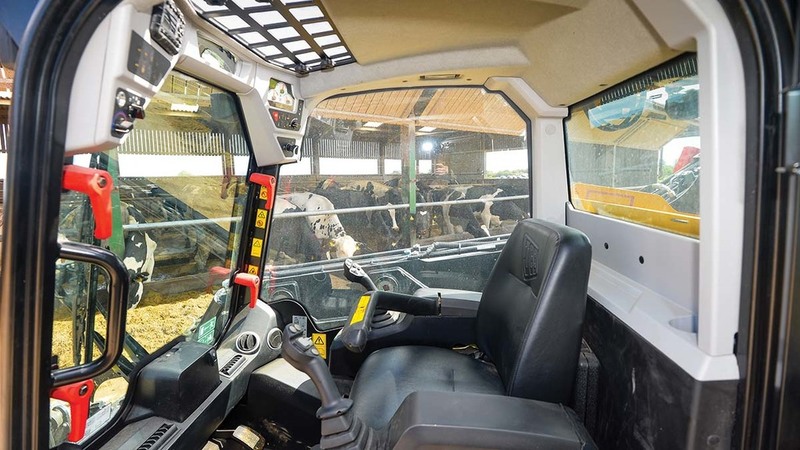 Single-sided boom allows easy access into the cab. Controls are simple enough, and wide-angle rear view mirror is excellent. The Teleskid certainly outperforms its compact appearance, with decent grunt and an impressive lifting capacity. Pushing comfort zones with the plucky loader can start to make a few body areas twitch, so an extra level of common sense has to be applied, as with any compact machine.